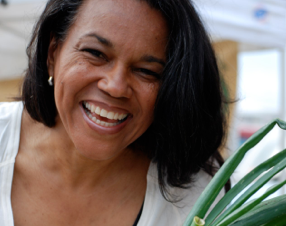 Toni Tipton-Martin is an award-winning food and nutrition journalist and community activist who is busy building a healthier community through her books, classes, and foundation. She is the author of The Jemima Code: Two Centuries of African American Cookbooks (University of Texas) – a widely-acclaimed, annotated bibliography that tells the story behind her rare collection. The Jemima Code is also the title of a traveling exhibit featuring larger-than-life images of black cooks at work. In 1991, Tipton-Martin became the first African American woman to hold the position of food editor at a major daily newspaper, the Cleveland Plain Dealer. First Lady Michelle Obama invited her to the White House twice for her outreach to help families live healthier lives. In 2014 she earned the Southern Foodways Alliance John Egerton Prize for this work. With the prize as seed money, she hosted Soul Summit: A Conversation About Race, Identity, Power and Food. This unprecedented 3-day gathering invited writers, scholars, authors, chefs, and students interested in food justice to come together and celebrate African American Foodways. Tipton-Martin is a James Beard Book Award winner, and recently appeared as a guest judge on Bravo’s Top Chef.